Oh look, a post! Do you know what that means? I’m done! DONE! I done got me another diploma, Chaucer be damned! Graduation is next week and I won’t be walking for it, but you can bet your best two cents that I’ll take a picture with it to post next week. For the first time in…um…at least 21 years, I’m not in school. How did that happen? So much time now–time to cook, time to run, to bike, to hike, but for now, time to eat my way through Atlanta. I’ve been waiting for this trip for the past year (since I got back from Atlanta April a year ago). I decided that this trip home I would eat at all the places I’d been saving up on lists–sure, time to fill some cravings (oohh I so went to El Myr first thing and got a BBQ tofu taco and a margarita, godblessthem), but this week is all about the amazing food I’ve been reading about and stalking thanks to Creative Loafing, Lindsey of Adventurous Tastes, Eat it Atlanta’s Jimmy, Foodie Buddha, Blissful Glutton, Running with Tweezers, etc etc etc. First on the list (after El Myr, of course) was Sunday brunch, one of my favorite meals of the week. While I thought about going to Gato Bisco or some other brunch place I know, on a whim I suggested Parish. What a perfect suggestion! Parish was everything and more, just like the reviews I’d read. Spot-on delicious food. The space was much larger than I thought it would be, and the shabby chic Roman decor was a little off to me, but not in a bothersome way, and we were seated at a window overlooking the Freedom Parkway path, which was nice. 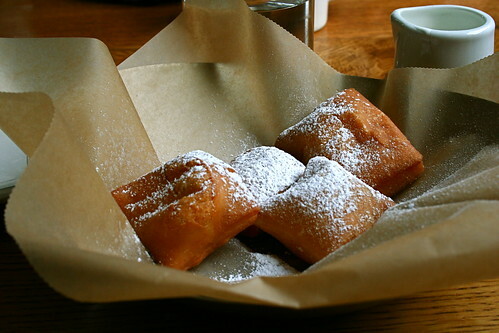 Part of their brunch service is a little basket of beignets–a nice touch. Not the best beignets I’ve had, but not bad. A little tough and not as pillowy as I like them, and they definitely needed more powdered sugar, but tasty all the same. For our courses, G & I both ordered riffs on benedicts: the Fried Green Tomato Benedict and the Fried Chicken Doghead Benedict. 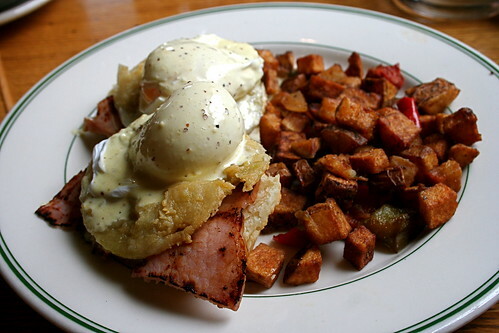 The Fried Green Tomato Benedict consisted of a fluffy biscuit topped with a slice of smoked ham, poached eggs, and bernaise with hashbrowns on the side. A benedict with fried green tomatoes was what I’d been going for last Christmas for Christmas brunch, but failed at miserably–no green ‘maters in Mobile. So to finally get one–albeit with ham and not fresh, local Mobile Bay crab–was fantastic. I love the tangy bite of the green tomato paired with the silky, fat eggs and bernaise. The hashbrowns I could do without. It’s a huge plate food, my goodness. The other benedict–the Fried Chicken Doghead Benedict–was amazing as well. 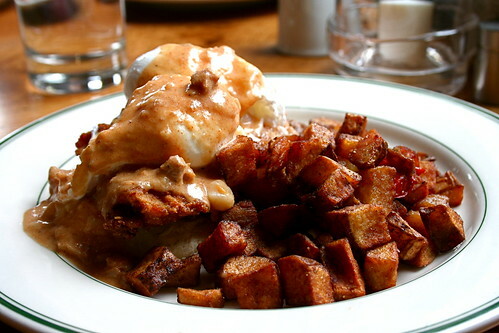 Picture the same delicious fluffy southern biscuit topped with a thin piece of fried chicken, poached eggs, and an andouille gravy. Again, killer good. I liked the lightness of the fried green tomato benedict a little better, just because it was a bit lighter. The andouille gravy was deeelish and I could put it on top of everything, and the chicken was very juicy and not overcooked. Over all, a fantastic southern Nawlins style plate of food. I’m so glad we went to Parish. I can only imagine how good the dinner service must be given the fantasticness of the brunch. Quick service, delicious food, and an open, airy light-filled space. 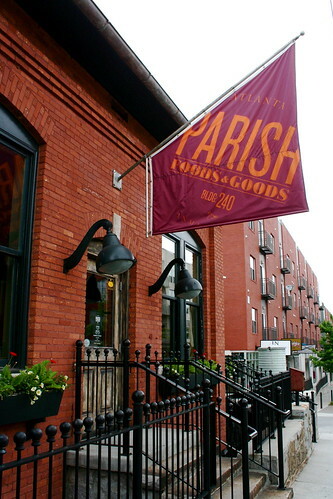 Two thumbs up for Parish! Congratulations! I can’t believe you’ve graduated already. I guess it seems like forever to you, but it seems like just yesterday you were moving to Virginia. Well first off, congratulations of graduating! You’e earned it now rock out! Woohoo! Congratulations! Enjoy your celebration of food! Congratulations, graduate! I’ve only been to Parish once. It’s not the most vegan-friendly place, but I’d like to go back for cocktails for sure. The atmosphere is great! Yay MFA! Congratulations! You definitely deserve to eat your way through ATL for that. Congratulations on graduating! I can’t think of a better way to celebrate than with food. Enjoy your free time – it won’t last long!